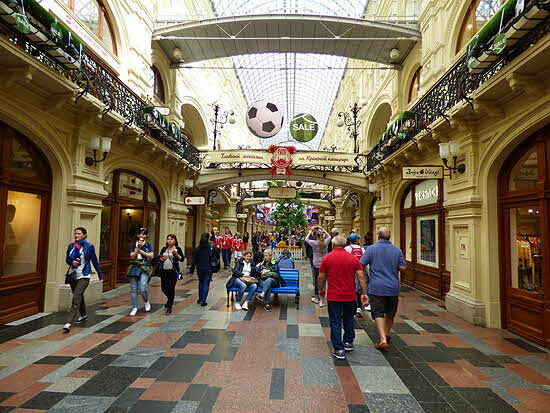 Our recent Viking River Cruise to Russia “Waterways of the Tsars” coincided with FIFA’s highly anticipated World Cup Soccer games, giving our cruise departure city of Moscow an air of contagious anticipation and excitement. 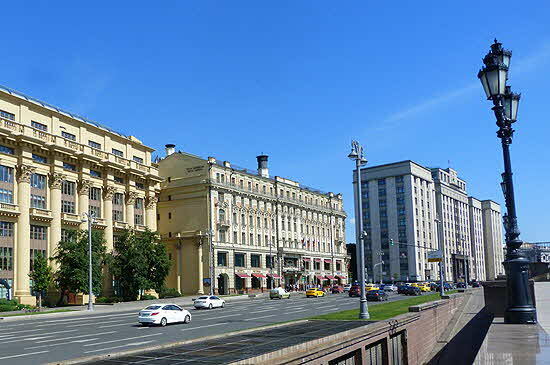 The perfect spring weather of warm temperatures, brilliant blue skies and extended daylight hours of mid-June – referred to as White Nights – also enhanced our visit to the Russian capital. While most theorists agree that the name Moscow derives from the Moskva River, our Viking guide suggested an alternate and more romantic theory. He claimed the original name came from Prince Musco and his reportedly cherished and beautiful wife Via; ergo Muscovia. Although of little historical credence, whichever version is correct, there is no disputing the fact that Moscow has had a storied past of wars, plagues, famines and fires since its recognized official founding in 1147 by Grand Prince of Kiev, Yury Dolgoruky. It was providential happenstance that Dolgoruky stopped on his way home to commemorate a successful campaign at a farmhouse on the Moskva River. Most likely the owner was in no mood to host Dolgoruky and his troops so he infamously killed the owner and took his wife and daughters and had his celebratory feast… thus Moscow was born. Moscow’s prominence really began with Dolgoruky’s building of the Kremlin in 1150. The Kremlin, which means fortress, was constructed of wood, an easily obtainable material gathered from the abundant surrounding forests. Wood was used on buildings, bridges, and even roads were laid in timber making the city extremely vulnerable to fire. On many occasions the city was burnt to the ground and rebuilt, which may account for its lack of an “old town” feeling. Currently, it's a city that presents itself as no-nonsense, where one neighborhood is only distinguished from the others by the way its mid-rise apartment blocks are maintained. Moscow is a city of massive buildings with broad open spaces and a surprising number of landscaped parks and green areas. Monumental buildings, many constructed during the Stalinist era, are the norm and skyscrapers are only recently coming into fashion; our guide proudly pointed out the group of 5 shining new towers lining one side of the river. Due to apparently endless open space, the grey soviet-style blocks of five-story apartment buildings spread out from the center like a spider's web. Further out continuing the circular pattern are new residential areas sprouting up, thankfully with somewhat more stylish architecture. Moscow is considered the largest city in the world with 2,500 square kilometers, housing 12.5 million people… 15 million including the suburbs. It is the capital of the country and the center of culture, industry, politics, education, science and sports. According to our guide Svetlana, everything in Moscow is “the best, the biggest, the greatest” her civic pride punctuated almost every sentence. 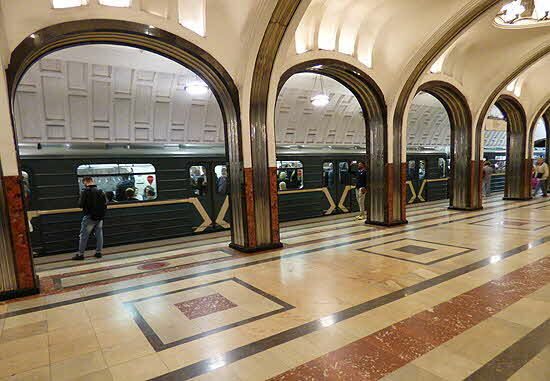 Our tour of Moscow began with a ride on the famous metro, a herculean task for Svetlana to navigate a group of ogling tourists into the rapid transit system. Opened in Moscow in 1935 with 13 stations there are currently 214 with many more in the planning stage to reach into the burgeoning suburbs. Having lived in New York City for many years, I considered myself an experienced subway rider and was anxious to visit the highly touted Moscow Metro. Unless you know where the entrances are it’s difficult to find them as the only designation appears to be a modest “M” on the facade of one of the many massive buildings. Once safely inside, thanks to Svetlana counting noses, we began the long, long, long escalator ride down to the subway level. Apparently the Aeroport Station on the Green Line is not only the deepest it is also one of the most decorated. The ride takes close to 5 minutes on a high-speed escalator so steep and deep you can’t see the bottom. I thought it was an optical illusion that all riders on the adjourning escalator were leaning backwards, but soon realized that the angle of decent was so great you are forced to balance by leaning back. No expense was spared to make the Moscow Metro the most beautiful in the world with many stations decorated with marble sculptures, bas-reliefs, and crystal chandeliers. At Aeroport seven different colors of marble and stone from the Ural Mountains line the walls and at every arched entrance to the trains are stunning heroic life-size bronze sculptures. 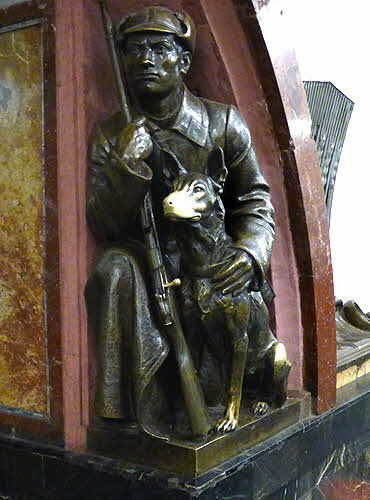 One of the bronzes is of a soldier holding a gun so realistic that the barrel is worn shinny and bright from so many passing Muscovites trying to remove it, another was of a figure with a dog; it is traditional for Muscovites to rub the dog's nose for good luck. The trains run frequently, necessitated by the enormous number of people they move on a daily basis. We successfully navigated as a group the two stops to Mayakovskaya Station, this time decorated with beautiful ceiling mosaics depicting historical events. Our final stop was Teatrainaya Station, which let us out right in the center of the city within walking distance of Red Square, the Bolshoi Theater, St. 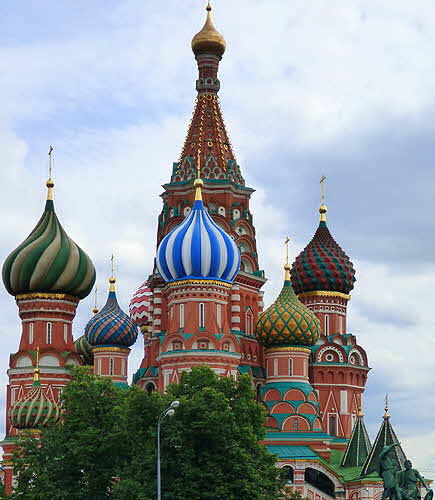 Basil Cathedral, the Kremlin and the famous department store Gum, pronounced Goom. 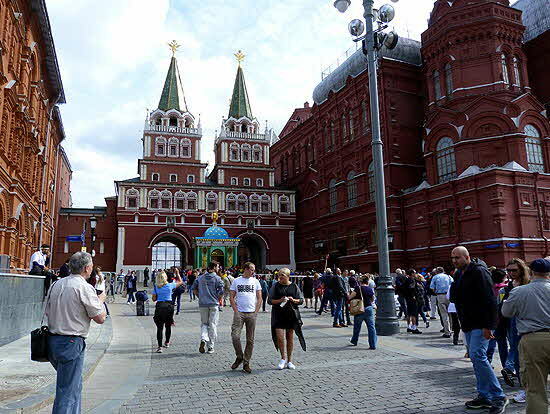 Due to the press of crowds, Red Square was closed to tourists but the iconic St. Basil Cathedral, with it’s fantastic onion domes visible in all its glory, eliciting gasps of delight from everyone that turned the corner and found themselves facing this famous church. Gum department store was reminiscent of a high-end mall on several levels under a massive glass roof featuring international designer shops with colorful, mostly ice cream stalls, on the ground floor. For me the highlight of visiting the Kremlin was fortuitous as it occurred on a Saturday, the day that the Presidential guard parades at noon. 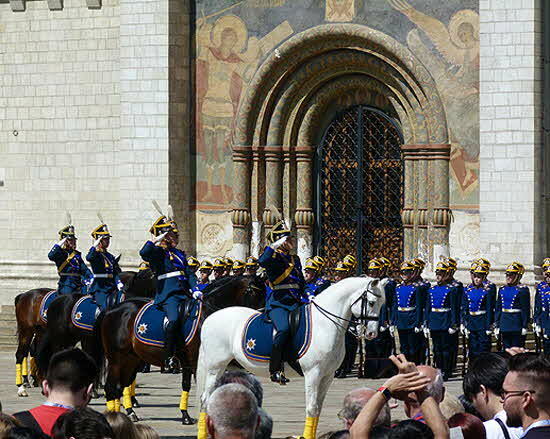 There was a band, cavalry, precision marching and gun drills… all very grand. But the highlight for shopaholics, might be the 3-story underground shopping mall beneath the Kremlin, again all very grand. Later that night we were treated to a folklore concert by the Moscova Musical Group playing a mix of classical Russian composers and folk tunes on old Russian string instruments like the domra, gusli harp, and balalaika. All the musical performances we attended during our trip were of very high professional quality and extremely enjoyable giving credence to the Russian reputation for artistic preeminence. 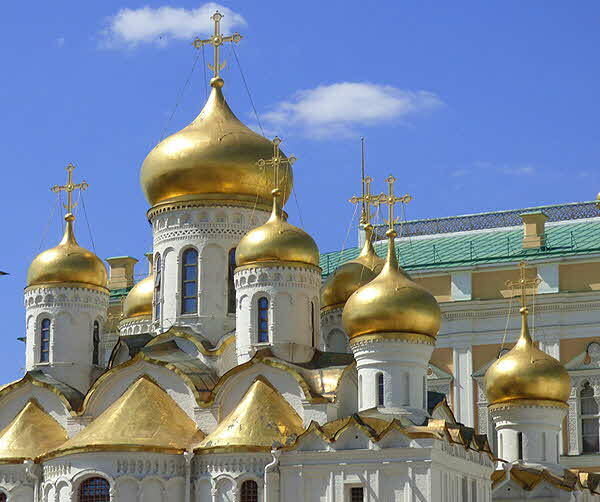 There is so much more to see in Moscow; museums and monasteries to visit; bridges to cross; gold-domed churches galore to photograph against an unbelievable clear blue sky; and people to meet… people just like us.